We had a pizza dinner party last week for our friends, Bruce and Felix, and Felix’s daughter, Sierra. When I’m making pizza, I go a little crazy with toppings. It’s an obsession. I admit it. My ultimate fear in life is that there won’t be enough food. I suspect it’s a southern thing that I inherited from my grandmother. In my mind, if you don’t have at least twice as much food as you need, there’s not enough. We made four pizzas, and, as per usual I had enough toppings for six or eight. Dishes of roasted red peppers, onions, mushrooms, spinach, rotisserie chicken, roasted tomatoes, pesto, and three cheeses filled my countertop. I think everyone agreed that the roasted tomatoes won the evening. Tomato season is one of my favorite things about summer. During the season, our neighborhood organic farmers market sells every variety of locally grown tomatoes you can imagine. For the rest of the year, I find that Roma tomatoes are the best bet in terms of flavor and texture. That being said, they’re often lacking in real tomato flavor. Roasting them can solve this problem. Slow roasting tomatoes significantly intensifies their flavor. They’re simple to prepare, and I make them often when summer tomatoes aren’t available. Roasted tomatoes are great in salads; they’re an ideal ingredient for pizza; they’re a classic topping for bruschetta; and they make a perfect side for a grilled steak dinner. For this recipe, I roasted the tomatoes with olive oil, garlic, and fresh thyme. If you’re making them as an accompaniment for a steak, I’d consider grating some Parmesan cheese on them for the last 10 minutes of roasting. 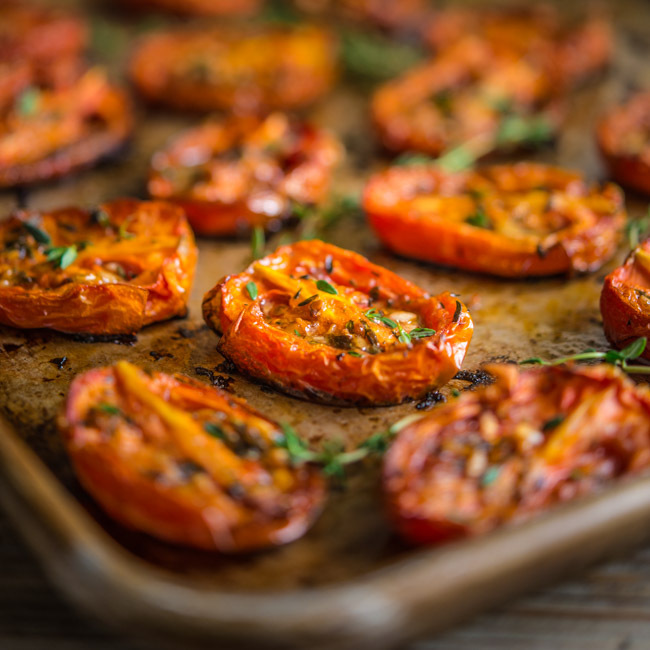 If you’re like me, you’ll munch on a few of these tomatoes right off the baking sheet. They only take minutes to prepare and once they’re in the oven, you can set an alarm and forget about them for a couple of hours. If you’re a tomato fan, give these a try, and I feel certain you’ll make them a regular in your kitchen. 1. Preheat oven to 275 degrees. In a medium bowl, stir together olive oil, thyme, garlic, and salt. Toss tomatoes in mixture until coated. Place tomato halves cut side up on baking sheet. Spoon remaining oil mixture over tomatoes. 2. Transfer baking sheet to oven and cook for 2 1/2 hours, depending on size of tomatoes. Remove from oven and cool completely. My first batch was SO good. I’m hoping so! Doing more today on a Traeger smoker. I love roasted tomatoes, and these photos are spectacular! Thanks so much, Kalyn! Have a great weekend! OMG, I am cray cray for slow-roasted tomatoes like this. In fact, I make tons and tons of them during the summer, when tomatoes don’t taste like CARDBOARD, and then freeze them so I can have them on my pizzas all winter long. Glad I’ve got a tomato roasting friend in you, Bill! This looks delicious. I bought Roma tomatoes at Costco, always a super-sized amount, and now I won’t waste them. By the way, thank you for including the print option on your blog for printing recipes, and thank you for providing good-sized font that is easy to read while cooking! Thanks for dropping by, Lynn! Hope you enjoy the recipe! Definitely try these, Lily. You won’t find them dry at all. Thanks for dropping. I adore tomato season too during the summer, and now I know exactly what to make when that time comes! Roast tomatoes are so awesome! And at this time of the year, it’s the best way to coax flavor out of them. Super stuff — thanks. This roasted roma tomato recipe is a mighty fine way for me to use up a glut of tomatoes I have on hand… as I’m one of those people who can never cook all my fresh produce fast enough! We love to roast tomatoes in the winter, when the store-bought ones resemble shrapnel. The long. slow roasting brings even those tough ol’ birds to life. Thanks for the reminder!! I agree with you, Lizzie. Winter tomatoes are best when slow roasted. Thanks for stopping by!